I’ve already published an account of our holiday in the Netherlands through a child’s eyes (Tatty Bear’s Holland Holiday). 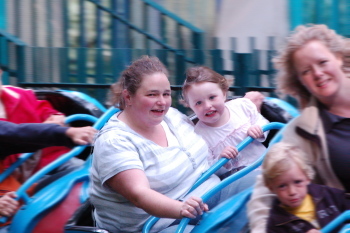 This is my account of the holiday from a parents view. This was a 9 night (+1 in a hotel), staying in a Keycamp caravan and travelling in our own car. 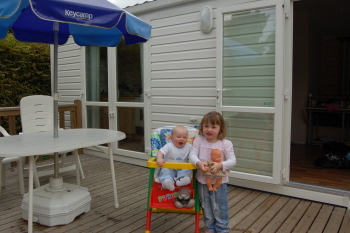 We have stayed in a Caravan with Keycamp before – see our Paris holiday review. We chose the Harwich to Hook of Holland sailing to go for a longer sea crossing, but less driving to the destination. This is a Stena Sealink route on the Stena Britannica on the way out. The outbound ferry departed early in the morning, so we travelled down the day before and stayed at the Travel Inn at Harwich. The hotel was very good, we had a family room and the child’s bed was already made and it included a cot. The alternative would have been to go for a night crossing and rent a cabin. The crossing was 6.5 hours long. We travelled at a weekend and there was a small children’s play area with computers and some bead type toys. They also put on a children’s show was put on which was very good and kept the kids on the boat entertained. This crossing seamed to go very quickly and in no time were were driving to the caravan site. The drive to the Duinrell site was only about 30minutes. I followed sat-nav rather than the directions provided. When we arrived at the site it was a bit confusing about where to go, but we found the reception eventually and then the caravan. When we got to the caravan we discovered that we’d forgotten the bed linen. We had booked two holidays at the same time, one of which included bed linen, but this one didn’t. Keycamp did not have any spare linen (which I thought was a bit short-sighted as I’m sure we are not the only ones to have done this), but we were able to borrow some from the main site reception. In the end it saved us the £15 charge, but it’s not something I’d want to risk again! Note to self – don’t forget to check what is included before travelling! We also had access to the swimming pool (Tikibad) for which you had to be in before 2pm and could use for 2 hours (including changing time). Family changing facilities were poor at the Tikibad – with only two family changing rooms with baby changing areas (but no straps). It would have been impossible for only one of us to have taken the children swimming (although that’s not particularly easy anywhere). It did mean a lot of waiting for the room to come free (or to be able to share the room in some cases). The pool had something for all ages. The only complaint about the actual pool itself (rather than the changing areas), was that the steps to the slide in the toddler pool did not have any kind of hand rail and was very slippery. I saw several children, including Amelia, fall down the steps, although fortunately none were seriously injured. With the facilities included we spent quite a bit of time on site. The site included a mini-supermarket shop which was expensive and had limited choice. It also had a fried chicken takeaway which had good family pricing. There was also a buffet restaurant offering a range of local and other foods. It included a small children’s buffet table, which had some food that our daughter would eat (chicken nuggets & smiley faces). Both these shut at 8pm, a fairly reasonable time, but a bit early if you’ve had a really active day and are getting back late. There are also a number of fast food type restaurants / kiosks in the amusement park. On one of the days we went to the local beach. A useful tip is that if your child likes building sandcastles (and who doesn’t?) then take your own bucket and spade (or buy them from the site shop). We were unable to find anywhere that sold these essentials in either the remote beach at Wassennar, or the bigger seaside town of Katwijkseweg. In fact I got funny looks when I asked about a bucket and spade at the toy shop in Katwijkseweg, anyone would think that they had never heard of sandcastles. The Bart Smidt in Scheveningen did sell them (but that was a different day out). On a particularly wet day, we went to Rotterdam shopping. We weren’t sure of what restaurants would be baby friendly so we ate at KFC. Fortunately this KFC was able to provide hot water to warm the baby milk bottle up unlike some in the UK. There was a charge for using the KFC toilet which is a bit of a shock for someone from the UK, but it seams to be the norm in the Netherlands. You would think that paying to use the toilet would mean that they were nice, but the ones in KFC were in a real state, completely covered with graffiti. 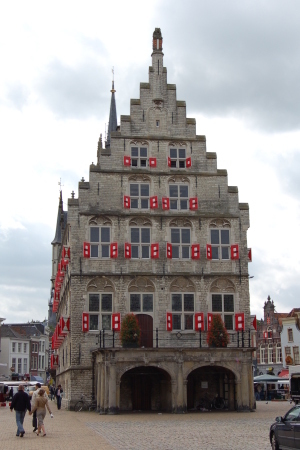 We visited Gouda on a Thursday when the cheese market was on. We didn’t realise the cheese market closed at about lunchtime, but we still got time to have a quick look around. We ate in one of the restaurants around the market square. The restaurant did have a children’s menu, but that only applied in the evenings. We had a pancake which was about the same price as the evening children’s menu. The restaurant included a baby changing table located just outside the toilets where they also had a small table for some colouring. We looked inside the cheese museum shop, but didn’t go into the museum itself. It also had a reasonable shopping centre. 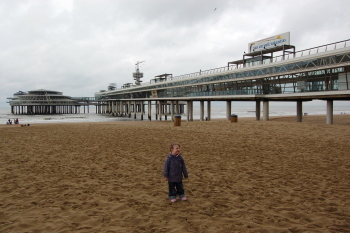 We also went to Scheveningen for a day-out. This is the nearest thing to a UK holiday resort. There is a pier with kiosk style shops, and a variety of shops on the promenade. There is also a carousel (Merry-go-round), although this turned out to be quite expensive (we’d already promised our daughter she could go on before we found the price). There is also a Sealife centre. The sea life centre did not have very good access as the pushchair had to be carried up and down steps to get into and out of the centre. It was however a good place to get out of the rain. On the last day we had to be out of the caravan at 10am (fairly standard for self-catering). Although we could have then gone into the amusement park again we instead set-off to Hoek van Holland planning to go to a beach on the way to the ferry. Our daughter was a little sick so we didn’t stop at the beach, but she was feeling better when we got to Hoek van Holland so we explored the market and bought a few last minute gifts before catching the return ferry. The return ferry did have a children’s area with a TV showing cartoons, a touch screen computer and a few bead toys. They did not put on any entertainment for the children and as a result the journey time dragged on. It was a relief to finally get back to dry land. We arrived back in England in the evening and we still had a long drive back. We didn’t go on the motorway so there wasn’t much in the way of service stations. We therefore had to stop at McDonalds to feed our baby son. It was about midnight when we finally got back home, very tired and ready for bed. We had a great holiday. Holland is a good country to visit and we’d certainly like to go back there again sometime. 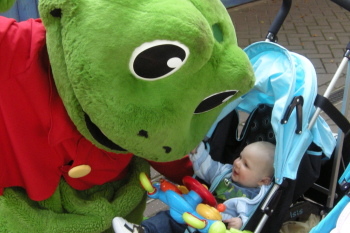 This entry was posted on Monday, October 20th, 2008 and is filed under Babies, Children, General, Holiday, Tourism. You can follow any responses to this entry through the RSS 2.0 feed. Both comments and pings are currently closed.